Whether you’re a longtime fan of Alexa Chung’s boyish-feminine style (who isn’t?) or just looking for a little something to treat yourself with before all the gift-giving madness begins, you’ll want to check out this oh-so-chic holiday collection—all approved by the British model and designer herself, of course. AG’s making wardrobe planning for every kind of festivity less of a chore with a slew of pieces featuring evening-ready details. Think plenty of velvet, moto zippers, lustrous coatings, shiny studding, and more—all balanced by the brand’s perfectly faded casual-cool denim. And take note: We’ve done the legwork for you, picking out the top items and pairing them with key styling tips that’ll have you channeling your inner Anglophile all party season long. Ready to unleash your inner It Brit? Scroll down for our favorite pieces from AG’s latest glamour-meets–rock ’n’ roll collection—and start shopping now. One of our favorite things about Chung’s style is how her ensembles always feel effortlessly pulled together and true to her covetable aesthetic. Since the holidays involve a little extra sartorial refresh (hello, office parties, nights out, and New Year’s Eve), try incorporating rich textures into your outfit without letting them overpower the rest of your look. 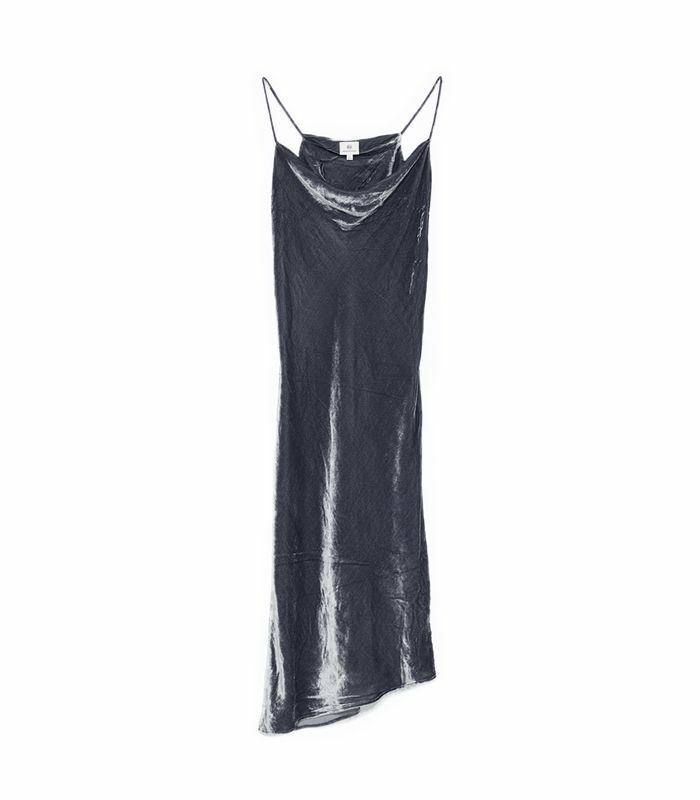 A plush slip dress becomes daytime-appropriate when layered over turtleneck and paired with combat boots. Silver-coated jeans provide an unexpectedly glam alternative to a sparkly mini. Treat the glimmer embellishments down the sides of these pants like tuxedo stripes, and style accordingly. We’re partial to pairing with a crisp white button-down and a tailored blazer for a jazzed-up tomboy-inspired vibe. From an ultra-cozy sweater to a classic striped tee to a silky camisole with a matching scarf, let’s hear it for the wardrobe workhorses—and Chung go-tos. These are those winter-and-beyond items you’ll reach for well into 2018. Make like Chung and pair this knit with everything from rocker-esque skinnies and sleek ankle boots to a suede skirt and this season’s glitter-flecked heels. Fact: You can never have too many striped shirts. Consider this your ultimate layering piece that’s a notch up from a simple gray tee. A starry print tank and matching scarf lends a ’70s-inspired touch—especially when paired with high-waist jeans à la Chung. Whether it’s with overalls, a boyfriend jacket, or well-worn jeans, Chung always manages to make denim an event. Take fashion notes with these fresh updates. Try this grown-up take on a one-piece with a turtleneck, a trench coat, and loafers for lunch with the grandparents. Dress up this new perfectly vintage-inspired style with a Chung-worthy fancy top, a blazer, and party shoes for an evening filled with merrymaking and spiced cocktails. For the colder months, don’t hesitate to layer this versatile favorite over cardigans and sweaters, and under bombers and puffers. Or follow Chung’s lead and double up with not-too-matchy jeans (e.g., the pair above) and a festive top. There’s more where that came from—check out AG’s fresh drop of new arrivals here.